If you’re guilty of having a bunch of wilting greens in your fridge each week, this month’s recipe is for you! 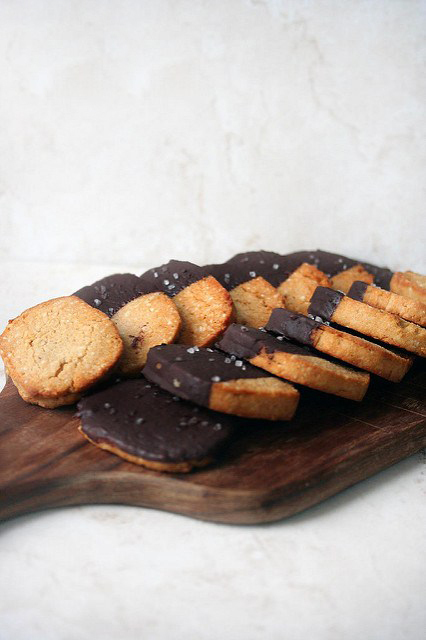 It’s easier than make than cut out cookies, great for picky eaters, and for curbing cravings while still getting a hidden dose of nourishment. To understand the unique layout of my ratio based recipes & the categories mentioned, check out this Introduction to Humble Luxury in the Kitchen. In this recipe I use cassava flour, a common grain free flour that behaves in a similar manner to all purpose flour. Please be aware that cassava flour does not behave in a similar way to almond flour or coconut flour. These flours are very different and will not be a 1-1 sub for cassava. Be mindful when mixing cassava flour and any gluten free blends that include xanthan gum as they can get gummy if overmixed. Mix your dough just until everything is well combined. 3/4 cup packed dark greens like spinach, kale, chard, collards, etc. 1 cup dark greens like spinach, kale, chard, collards, etc. *Please note that I am not an herbalist or a natural healthcare provider that works with herbs. I cannot recommend specific herbs or combinations of medicinal plants for you personally. What’s included here is a general list. 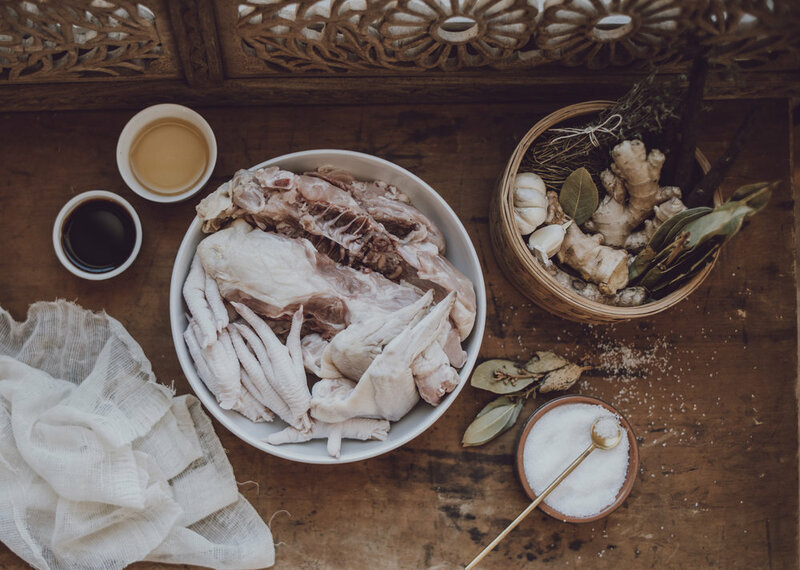 If you’re not familiar with these products and would like to learn more, I recommend contacting a local TCM (Traditional Chinese Medicine) Practitioner that works with herbs, an ND/Naturopathic Doctor, or an Herbalist in your area. Asian Flavors like seaweeds, tamari/soy sauce, black sesame seeds, wasabi, etc. Italian Flavors like basil, garlic, parmesan, parsley, etc. Indian Flavors like cumin, turmeric, fennel, etc. Get creative with your flavor combos and share what you make in the comments below! If you add a lot of powders to your crackers, that may throw off the amount of flour you use. If you dough is really dry, add a bit more broth/water. I’d personally recommend to keep each batch relatively simple. With 1 scoop of green powder and 2 scoops of collagen peptides, the ratio wasn’t thrown off at all. Add your dark leafy greens on top of the liquid and blend until the greens are completely broken down. This should look like a smooth green juice. Please be aware that if you don’t have a high powered blender, heartier greens like kale, chard, & collards may be tough to break down. In this case, for a smooth cracker, opt for spinach. If you have other greens & a low powered blender, the recipe will still work, but you will have some chunks of greens in your crackers and they won’t be completely hidden. Pour your blended greens into your mixing bowl. With slightly damp hands, pat the dough into a ball. It should be smooth once formed. (see photo below) Wrap the ball in a piece of parchment paper that’s the size of your sheet pan, and chill in the refrigerator for 15-20 minutes. Once the dough is chilled, set your oven for 350 degrees F and make sure there’s a rack in the center of the oven. Rip a second sheet of parchment paper the size of your sheet pan. On your counter, unwrap your dough leaving the parchment it was wrapped in underneath. With slight damp hands, pat your dough into a flattened oval with the long sides running parallel to the long edge of the parchment paper. Place the second sheet of parchment on top of the dough. Your dough should now be sandwiched between two sheets of parchment paper. Slide the bottom parchment & dough onto your sheet tray, parchment side down. The dough will be baked on top of this sheet of parchment. Bake on the center rack of your oven until slightly brown. Depending on how large of a batch you make, the type & temp of your oven (if it runs true), and how thick/thin you rolled your dough, baking time will vary. I made a half sheet tray at 1/4 in thick with some hot spots in my oven and baked for 35-40 minutes. I suggest setting a timer for 25 minutes, checking on the crackers, rotate the tray in the oven, then check again in another 10. Baking goes slow in the beginning and quick at the end. If you’re crackers are getting close to done, check them more frequently at the end. Also, use your senses! Remember you’re making crackers. If you like an extra crunchy cracker, let ‘em bake a minute or two longer. Let your nose guide you. Poke at the dough to see if it’s firm enough. Channel your grandmother. Once your crackers are done, remove them from the oven. Let rest until cool enough to handle. Flip the larger cracker onto a cooling rack and carefully remove the parchment. Break the large cracker into smaller crackers of your desired size. Note: the crackers won’t all be a uniform shape. This format of cracker making simplifies the process so it will hopefully become an effortless addition in your kitchen. Done is better than perfect! Eat fresh or store in an air tight container for 1 week. NOTE: AIR IS THE ENEMY OF BAKED GOODS. Leaving your crackers exposed to the air for a prolonged time will make them go stale. Seal em up to keep the crunch. if you make a batch of crackers you Don’t love, take notes and switch it up next time. You’re developing your own favorite & unique recipe based off of my ratio. That’s a process and like any work of art, it’s in your hands. Now I want to hear from you! Share what flavor combination you made & what you served on/with your crackers below. I’m so excited to be sharing recipes again. After a 5 year hiatus from sharing in a space like this, it feels good to be back at it with a whole lot more life experience and a very clear perspective in the kitchen. To kick things off, I’m sharing a foundational element from my kitchen: bone broth. I like to drink a mug of bone broth with breakfast and usually rely pretty heavily on it for quick, nutrient dense dinners and lunches. For every 1lb of chicken bones used, you’ll need roughly 1.5 quarts of water. You can use more water if you need to stretch your ingredients, especially if you add anything from the optional add in list. Adding more water without add ins will make your broth less flavorful & not as gelatinous, but it’s totally doable if you need to get more from your pounds of bones. These add ins also build on the ratio above, for every 1 lb of bones used, use roughly the amounts below. Adjust based on how much broth you’re making and what you have in your kitchen. Again, these are rough estimates. If you only have 1 TBSP of vinegar or 1 onion for 6 lbs of bones, it’s okay. You’ll still end up with bone broth, the flavor will just be a bit different. assortment of culinary herbs like thyme, rosemary, bay leaf, sage, etc. I’m not an herbalist. I can’t tell you what you should and shouldn’t take. There are a lot of factors that are involved in that level of advice. What I can share is what I use for myself in my kitchen. Please remember our bodies are different, our needs are different, and our different access points to herbs varies. If you’re interested in knowing more about medicinal herbs for your specific needs, I recommend looking into herbalists in your area. And if you’re passionate about herbs & access, I recommend supporting Seed, Root, Bloom - an herbal school for and by people who are black, indigenous, and from historically racially oppressed communities. When I add herbs & onion to my broth, I also typically increase the water I use by about 1/2 quart. Place bones, feet, and wings (if using) into the appropriate pot (see below). Roughly chop up vegetables & herbs if using and add to the bones. Cook on low for 12 - 24 hours. For stove top: use a medium - large stock pot, depending on the amount of ingredients you use. For crockpot: use the included pot. Place all ingredients into the pot. 3. the steam release knob is turned to the ‘sealing’ position. *Note: it typically takes 15-30 minutes for the pressure cooker to fully pressurize. The timer will show once the instant pot is at full pressure. After the timer goes off, allow the pressure to release naturally. Just like pressurizing in the beginning, this will take about 15-30 minutes. The float valve will fall when the pressure has released. Strain broth and serve, or allow the broth to chill & store it as needed (see below). Humble luxury in the kitchen is all about finding the way that works for you based on your needs, desires, and resources. I encourage you to explore with what I’ve offered here and find your favorite way to make your broth. If you make a batch you don’t love, take notes and try something different next time. Think like your grandmother in the kitchen. Use your sense, your hands, your ears, your eyes. Let your food sing to you! If you use broth in cooking, consider freezing in ice cube trays or in 1 cup portions. This will allow you to pull a small amount out at a time and will help to avoid waste. Glass Jars: make sure to leave 1.5 - 2 inches of space from the broth to the top of the jar to allow room for expansion. I also recommend letting the broth freeze fully before screwing the lid on. This will keep your glass jars from breaking. You can use dry erase marker on the lid before freezing to note when the broth was made. Silicone Bags: Again, make sure to leave room for expansion. Most silicone bags have a fill line and typically account for frozen goods. I recommend using the freezer door (if you have one with shelves) to let the broth freeze upright. Once fully frozen, it can be moved anywhere in the freezer without worry of spilling. And of course, any other means of storage will work too. Just always make sure to leave room for expansion - even in plastic. What’s your favorite way to make broth? Share your broth on Instagram and use the #humbleluxuryinthekitchen or share below. Photo of my kitchen by Sam Stenson on 120mm film. As I return to recipe sharing after a 5 year hiatus, I’m excited to do so through lens of humble luxury. HUMBLE LUXURY is the idea that luxury, pleasure, and safety aren’t exclusive experiences for those who can buy it. These are feelings that live within us and are available to all of us. No matter your budget, humble luxury in the kitchen is all about finding a way that works for you. This is a process designed to help you meet your unique diet, budget, needs, and desires based on what you have access to. This post is here to explain what that means and how it relates to the food on my blog. You’ll see me mark each humble luxury recipe with categories that note when it’s good to eat this meal. This is a way to both share resources to help you support your body & family with greater ease, and have a quick guide when exploring the recipes on my site. When recipes are tagged with the following categories, they may check the box for one or all reasons listed below. Rather than using the common style of recipe sharing, I much prefer to use ratios. To me, this feels more traditional - like something our grandmothers did. They used about this much of one thing and about that much of another. They cooked with their senses. They smelled, tasted, measured in their palms, picked things up to feel weight, and listened to the songs of their ingredients. This is how I like to cook and my ratio based recipes are intended to be the foundation that allows you to do the same. This will give you more freedom to explore what you have on hand in your kitchen so you can use what you’ve got, instead of buying new ingredients. Rather than saying you need 4lbs of bones and 6 quarts of water for bone broth, I share my ratio of bone broth which is roughly 1 : 1.5 (read as ‘1 to 1.5’). That means for every 1 lb of bones used, you’ll need about 1.5 quarts of water. So if you have 3 lbs of bones, you’ll need 4.5 quarts of water. I say roughly because with bone broth, it really is flexible. 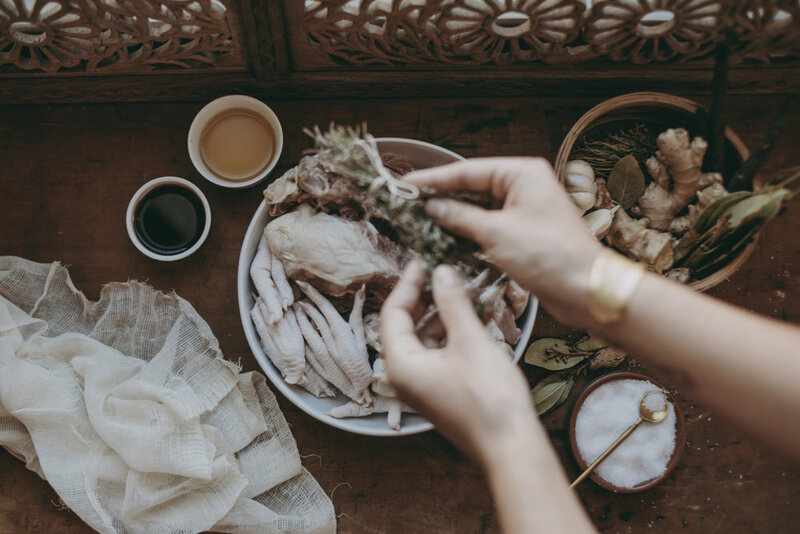 If you only have 1 lb of bones on hand but you need more than 1.5 qts of bone broth (and if you’re using a stovetop or crock pot method, note some of that water will cook off) then add more! You can always add more flavor with onions, garlic, and other veggies. It’s a guideline. If a recipe calls for an exact amount of something (often in baked goods with leavening ingredients like baking soda) I’ll note it specifically. If something can be loose, I’ll let you know. If it needs to be exact, I’ll let you know that too. You’ll also notice the ingredients lists for my recipes & ratios are different than most. I’ll always bold the absolute essential ingredients for a recipe and have additional add ins listed as optional. I do this so that the recipe are accessible financially to many different households. You can scale the recipes I share up and down based on your budget and family size. See the full recipe for Humble Luxury Bone Broth here.If anything needs to adjust in the basic ratio based on the add ins, that’ll be noted. For example, in the bone broth, if adding an onion & herbs I would also add 1/2 quart more water. I’m excited to share this new perspective in the kitchen with you! Now I’d love to hear from you! What do you think about humble luxury in the kitchen? This is a recipe from my 2014 blog archive and it’s one I still absolute adore today! A lot has changed since I originally wrote & photographed this recipe, but it’s still a go-to of mine! Chocolate ganache is on my list of favorite chocolate treats. Why? Because this stuff is super versatile and it creates a big impact with minimal effort. Pour it on a cake or cookies, whip it for frosting, or roll it for truffles...you just can't go wrong. And it only takes about 10 minutes to make. It’s kitchen magic. Measure chocolate chips into a glass bowl and set aside. In a medium sauce pan bring coconut fat to a boil. Once boiling, pour over chocolate chips immediately and whisk until completely melted. Pour onto cake, tart, cupcakes, pie, ice cream, etc. immediately, or place in the fridge to harden for truffles or frosting. For truffles, let the ganache firm, then roll into small balls. Once formed, you can top your truffles with anything like chopped nuts, shredded coconut, cacao powder, or matcha. For frosting, let ganache firm, then beat with an electric mixer to fluff. It will still be a dense frosting, but will be lighter than the truffles once whipped. What are you dreaming of using this chocolate ganache for? This recipe was originally written in September of 2014. I found it in an old blog archive and wanted to share because it’s still a favorite of mine. I’ve been sober for nearly 5 years now and having a nice mocktail at a gathering is a great feeling. Also, this one is super special because it’s one of the drinks we had on offer at our wedding in 2013! Hope you all enjoy it! 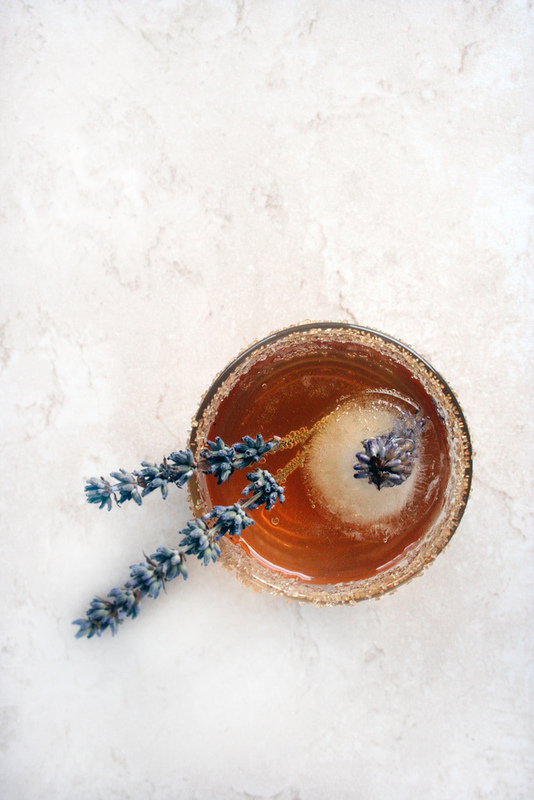 Recently I whipped up one of my favorite homemade drinks, lavender + earl grey soda. I don't drink alcohol much but I still enjoy something fun to drink at a gathering and this is my go to. This one is great for hosting parties because one drink can satisfy both your n/a friends and those enjoying alcohol with one simple substitution. Heat the water to a boil and combine with sugar. Stir until combined. Let cool and add lavender buds. Allow the lavender to infuse for 48 hours. Strain into a ball jar. Heat the water to a boil and combine with sugar. Stir until combined. To infuse there are 2 options: place the tea into a tea ball and place into hot simple syrup for 4 minutes, or let syrup cool and infuse tea for 48 hours. Wet the rim of a glass with water & dip into coconut palm sugar. 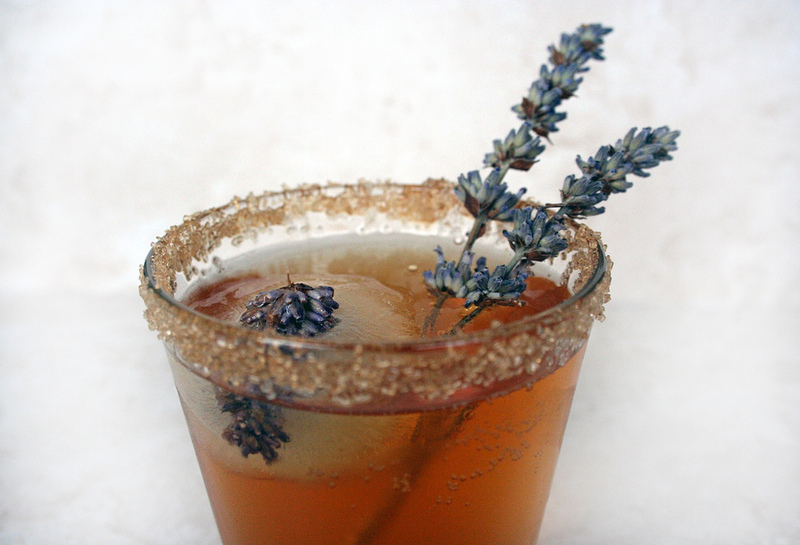 Combine 2 TBSP lavender syrup with 1 TBSP earl grey syrup. Top with soda water or champagne. Garnish with lavender flowers. What’s your favorite non-alcoholic drink to serve to guests? Comment & share it below! Preheat oven to 350degrees and line a cookie sheet with parchment or a silpat mat. In a food processor or blender combine egg, honey, brown sugar, coconut oil, and vanilla. In a medium sized bowl combine flours, cocoa powder, and baking soda. Add to food processor and blend for 20-30 seconds. Scrape the sides & pulse a few more times. Dump mixture into the bowl and fold in chocolate chunks. Lay a piece of parchment paper on the counter. Dump the cookie dough onto the center of the parchment paper. Form the dough into a horizontal log. Place the wrapped log of dough in the freezer (up to 6 months). Scoop ping pong sized balls of dough onto the cookie sheet. With damp hands form into balls and flatten into 1/2 in thick circles. Preheat the oven to 350 degrees and line a cookie sheet with parchment or a silpat mat. Remove the dough from the freezer 5 minutes before baking to let it soften a bit. Cut 1/2 inch slices of cookie dough and place them on the cookie sheet. Press slightly to flatten a bit and sprinkle with sea salt. And here’s the final recipe I’ve chosen to carry over from the 2014 blog archive. Like most things that happen in my kitchen, these cookies were a complete accident. In a food processor, blend eggs, vanilla, oil, & honey for 10-15 seconds. In a separate bowl, combine coconut flour, almond meal, baking soda, and salt. Pour wet mixture into dry, and scrape sides of the food processor with a rubber spatula. Mix well and let sit for 5-8 minutes. Dump mixture onto a piece of parchment and form into a log. Wrap tightly with parchment, twisting the edges shut. Place dough in freezer for at least 30 minutes, up to 6 months if wrapped well. Preheat oven to 350 degrees and line a cookie sheet with parchment or a silpat mat. Remove dough from freezer and cut 1/4 in slices off of the log. *These cookies don’t grow much so they can be placed close together. Place on a rack to cool before dipping. Stir honey into melted oil, then add vanilla. Pour wet mixture onto cacao powder and stir until smooth. Dip cookies into chocolate mix and chill on parchment lined cookie sheet until hard. *if you don’t have a double boiler, use a glass bowl nestled in a pot with about 2 in of water inside. The bowl shouldn’t touch the water. Place chocolate + coconut oil in top of double boiler. Once melted, dip half of each cookie in and return to parchment to dry.